Our E-design is a fast, fun way for you to work with our team without having to commit to the full design service and it's the perfect bridge to our clients based outside of Vancouver. Most of our shopping is done online and sent to you as a shopping list, to make getting those perfect pieces as easy as clicking the mouse on your computer. Send us details of your space(or spaces), give us some sense of your taste, lifestyle and design goals and we will provide you with a custom furniture plan, colour palette, fabric selection and all purchasing information. Working long-distance with our clients, we've designed rooms, and entire houses, in cities across Canada. E-design is perfect for clients who want to be actively involved in the design process and who want to guide the follow-through. Nancy Riesco personally leads the design process for every E-design project. You'll get a concept board, a space plan and a shopping list for the products to purchase. Measurements of your room(s) , ceiling to floor and each wall indicating any windows, doors or built-in features. Digital photos of the room(s) from every relevant angle plus an image or two of your home's exterior (feel free to include shots of you and/or your family and definitely any pets). Inspiration: anything you've seen that you've loved. Magazine tear sheets, Pinterest boards, photos of a friend's place, the website of a favourite hotel or destination -- the more information you provide, the better we'll be able to interpret your taste, and the better your design will be. We provide you with the resources and you do the rest! After creating your design plan and room concept boards, we give you a play-by-play of what to buy and where to purchase it. Included in this package is the opportunity to buy custom textiles and pillows, custom furniture, draperies, as well as to-the-trade-only lighting and furnishings. We can also suggest retail only items, if this is more in line with your budget. 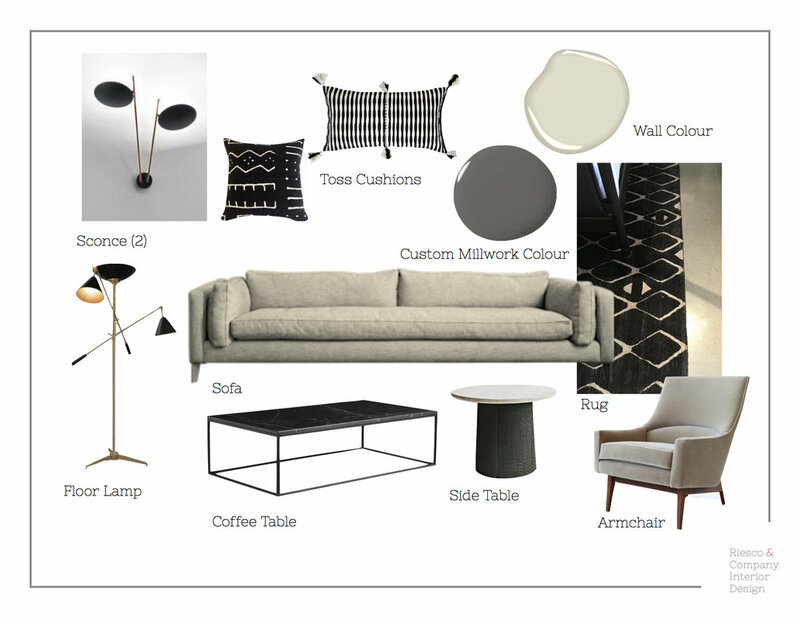 Room Concept Board: we realize that a central challenge in designing your own space is visualizing the final product. Our room concept boards will allow you to see all the components in the room come together. 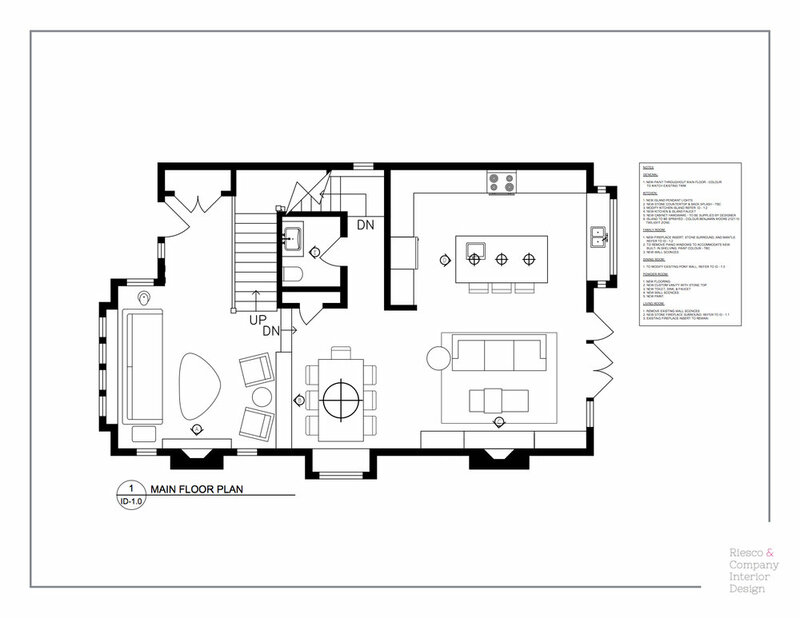 Space planning: includes a detailed furniture layout plan, drawn to scale, which references directly to the room concept board with fabric swatches and paint chips. No more worrying if that sofa will fit in the room. Shopping list: thorough and organized, our shopping lists will guide you through your room concept board, with clickable links to recommended items. The design fee for our E-design service varies based on needs and square footage, but most start around $3,000 (fee only, not including furniture budget). We pride ourselves in creating totally custom, unique and personality filled spaces for you -- whether they are full service or E-design, and this takes time. Please think critically about your true overall budget because the more we have to work with the more accurately we can design the space of your dreams. Please read terms & conditions prior to submitting the questionnaire.